Reading this book was, for me, like sitting down and watching an action movie. Bomb threats and explosions, mysterious black roses representing old stalkers, banks and hostages and the whole nine yards. Include a strong - and yet fragile! - female and her male protector for a good romance and, well, I guess you are all set. Honestly this book would make a good screen play. I don't normally do action/thrillers but I received this book from Brittanie, at Book Lover as part of the book swap I did with Sarah from Library Hospital. Of COURSE I was going to read it! And I'm not sorry that I did. It's written by Christian author Dee Henderson so even though it's suspenseful, it's also very clean. In a lot of ways this book reads like a whodunnit but involves a lot of modern day references and government agencies. The lead protagonist in this story is Kate O'Malley, an orphan with a mysterious past. She, along with her adopted O'Malley siblings, all grew up together and each went on to pursue a prestigious career in either law enforcement agencies or as medical personnel. There is a past history with the O'Malleys which unfolds as the book progresses. I do not intend to offer a spoiler on this book as this is exactly the type of novel that demands such protection. On so many levels. At any rate, I can say that if you like feeling all suspenseful and enjoy a good mystery, this is a good clean book for you to enjoy. If you aren't the type that does suspense then I'd have to say you might still enjoy this book. Nothing about it disturbed me in any great way. I was just tied to the book as I sought the conclusion. It's almost like a guy movie for girls or something. I was riveted to the plot and desperately wanted to find the end of it so I could breathe again. That being said, I probably won't read any of the other books in the O'Malley series but they do exist if you find you just didn't get enough the first go around. Thanks, Brittanie, for sharing one of your favorite books with me. Let's do it again sometime! BTW, if you enjoyed being part of the book swap last time, or have any interest in participating in the next one, stay tuned! Sarah and I are planning a winter swap so you'll have another chance to be involved. I have read this book and loved it! You're right in that Dee's books are full of suspense/action but still very clean. I've enjoyed several of her other books as well and they're very similar in style. 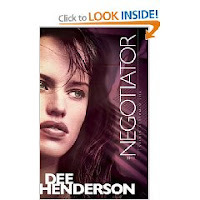 I have enjoyed all of Dee Henderson's books. This was the first one of hers I ever read. Glad you enjoyed it.